Manglore again hottest in India at 36.3c, Kottayam (Kerala) 36.2c and Cochin (Kerala) at 36.1c. Hottest place in the Northern Hemisphere on Monday was Kolda (Senegal) at 36.7c...quite close ! Coldest Day in India on Monday 15th was in Gorakhpur (East U.P.) with the mercury not crossing 11.7c. Days will rise by 2/3c from Wednesday, and coldest in the plains was 1.2c at Amritsar. Leh recorded -10c and Srinagar -3.3c on Monday morning. No Western Disturbance/ Any Systems expected in the India/Pakistan Region till 22nd January at least...dry weather. 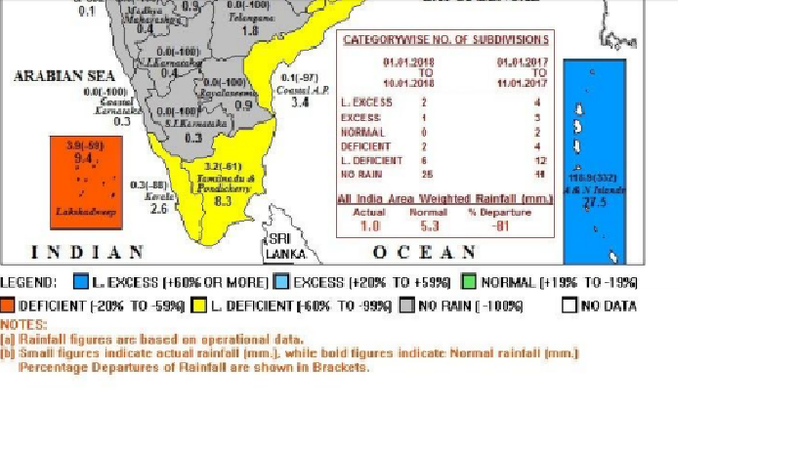 Dry weather in India/Pakistan/Nepal and Bangladesh till 22nd January. Mumbai: This week next few days: Warm around 33c and nights shifting from the pleasant temperatures of last week to 20c. Pune: Cloudy Tuesday with very light drizzles in some parts. Warm in the day and night. Temperatures drop by 2/3c from Thursday. Srinagar will be slightly cloudy, with dry weather. Next few days will be in the 13c to -3c range. Kolkata: Dry weather in the 25c -13c range. Delhi NCR: Shallow morning fog. In the 25c -8c range. No temperature drop in Mumbai till next few days?? A weak La Niña pattern continues in the tropical Pacific. This event is likely to be at or near its peak, with most models suggesting this La Niña will end during the southern autumn. Sea surface temperatures currently show a clear La Niña pattern, with coolest waters concentrated in the eastern Pacific Ocean. Likewise, some atmospheric indicators such as trade winds and cloudiness also show a clear La Niña signal. However, a continuing build-up of warmer water beneath the surface of the western Pacific is a likely precursor to the end of this event. In order for 2017–18 to be classed as a La Niña year, thresholds need to be exceeded for at least three months. Most climate models surveyed by the Bureau suggest this event is likely to last through the southern summer, and decay in the early southern autumn of 2018, so these thresholds are likely to be met. La Niña typically brings above average rainfall to eastern Australia during summer, particularly in northern New South Wales and Queensland. However, a weak La Niña will have less influence on Australian rainfall than a strong event. La Niña events can also increase the likelihood of prolonged warm spells for southeast Australia. Min 5.6℃. Massive difference for city like Delhi. Barmer 33℃ in jan itself.